Durable 9-Gauge Steel H-Stakes by Vibe Ink. Designed to fit 4mm and 5mm Corrugated Plastic Yard Signs or Lawn Signs. Great for Realtors, Real Estate, Private Sellers, Schools, Businesses, Political Campaigns, Construction & More! We provide a very wide yard stake (10 inches in length) which helps to keep your yard signs standing through more severe weather conditions. 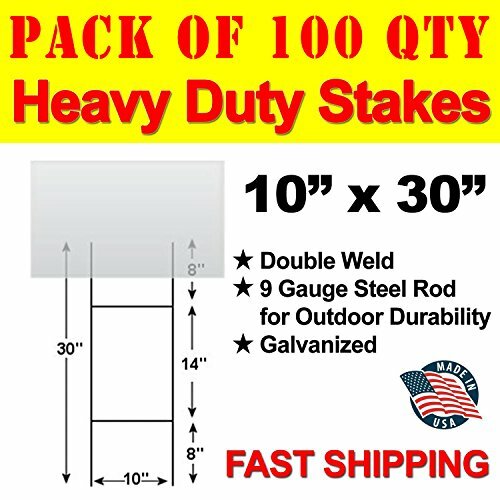 ✔ Heavy Duty "H" Frame Wire Stakes Made in the USA! ✔ Use: Indoor OR Outdoor use - Waterproof and Wind Resistant! Display in your front yard, lawn, garden or any area with grass! ✔ Great for Real Estate, Realtors, Crafts, Businesses, Construction, Political Campaigns, School Projects, Service Industry and More!